As the academic year draws to a close, DSU President Richard “Biff” Williams will present his annual Dixie State University Report and Update for the final President’s Colleagues of DSU meeting of the Spring 2017 semester. Williams will present at noon on Monday, May 1, in Lecture Hall 156 of the Taylor Health Science Center, located on the Dixie Regional Medical Center campus at 1526 East Medical Center Drive. The meeting is free and open to the public. 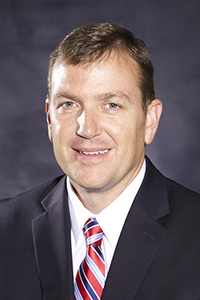 Williams was announced as the 18th president of Dixie State University on July 17, 2014, and began his term as president on August 11, 2014. Under Williams’ leadership, DSU launched its strategic plan, Dixie 2020: Status to Stature, in 2015 and has since added baccalaureate degrees, constructed new on-campus student housing, developed partnership programs with other universities, re-branded its athletic identity and grown in many other areas. A native of Brigham City Williams holds a Bachelor’s of Science in Lifestyle Management from Weber State University, a Master’s in Athletic Training from Indiana State and a doctorate in Curriculum and Instruction from New Mexico State University. President Williams and his wife, Kristin, are the parents of five children. After taking a recess for summer, the President’s Colleagues of DSU meetings will resume for the 2017-18 academic year on Oct. 2. The President’s Colleagues of DSU, established more than 20 years ago by former DSU President Douglas Alder, is a group of retired professors and other professionals who live mostly in the Washington County area. Alder, who also started DSU’s Honors Program, organized the group as a way to increase academic activities on campus. For more information about Dixie State University, visit dixie.edu.